Molly and Amanda Moore and their friends Shawn, Peichi, and Natasha have the hottest thing going-a cooking business called Dish! The girls have become great cooks and their business is really taking off. But mixing friendship with business is not always an easy recipe to follow! Summer is over and all of the Chef Girls are back in Brooklyn and back to business-or are they? 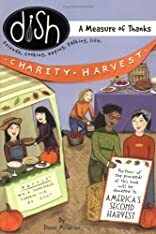 When Molly throws herself into planning a Charity Harvest fundraiser to benefit a local food bank, she must choose between her new interests and Dish.